The holiday shopping season kicked off over Thanksgiving weekend, and once again the biggest shopping event of the year shattered sales records. Many retailers began their “doorbuster” deals one day early on Thanksgiving night, resulting in a slight 1.8% decrease in Black Friday sales despite a 3.5% increase in foot traffic. According to ShopperTrak, consumers spent $11.2 billion at stores on Black Friday. 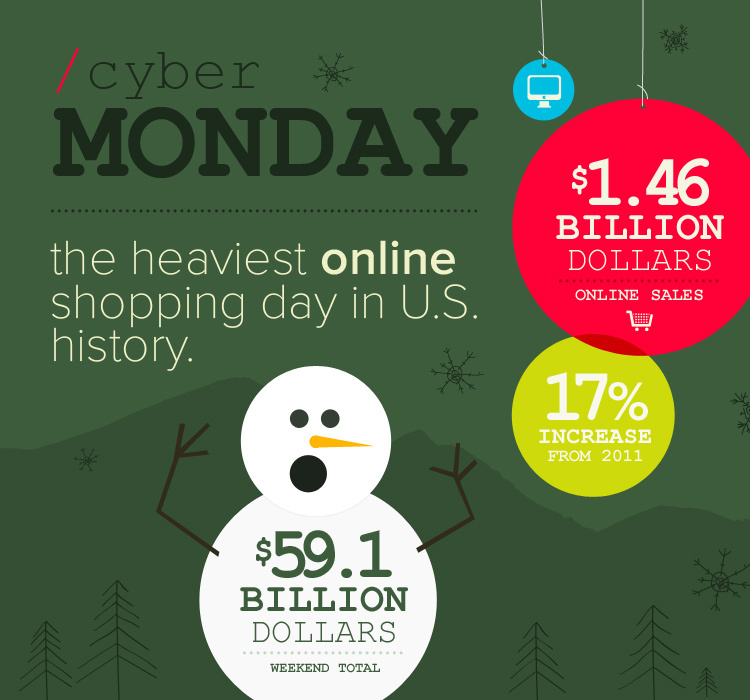 As in 2011, Cyber Monday once again broke the record for the heaviest online shopping day in U.S. history. This record-breaking day raked in $1.46 billion in online sales, an impressive 17% increase from last year. Online shopping also broke eCommerce records throughout the entire weekend - according to National Retail Federation, 27% of consumers shopped online on Thanksgiving and 47.5% shopped online on Black Friday, with Black Friday online sales reaching over $1 billion for the first time. Total spending over the four-day weekend was an astonishing $59.1 billion, up 12.8% from last year. The holiday shopping excitement is far from over, with comScore forecasting even bigger gains in sales throughout December. The bottom line? Online retailers can look forward to a very merry 2012 holiday season. Published on December 3, 2012 .